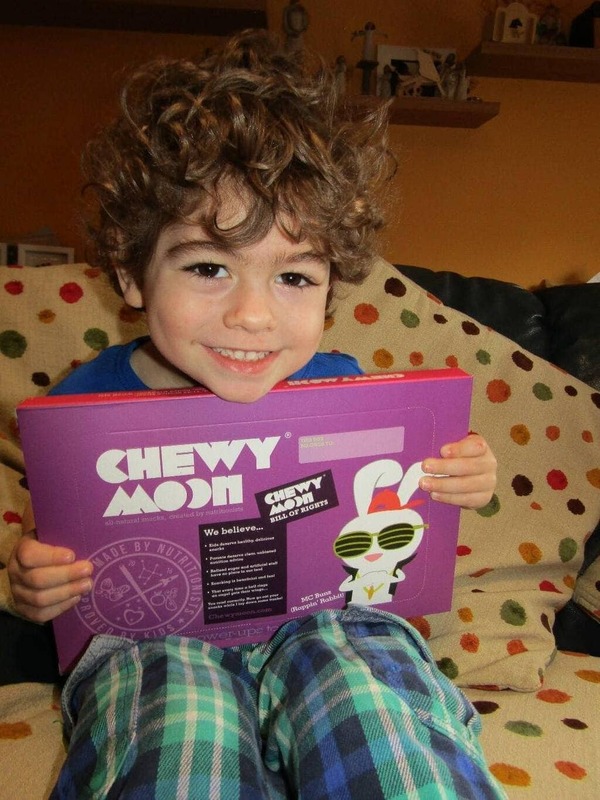 Chewymoon provide ‘delicious, 100% natural snacks. Created by nutritionists, approved by kids and delivered through your letterbox’. 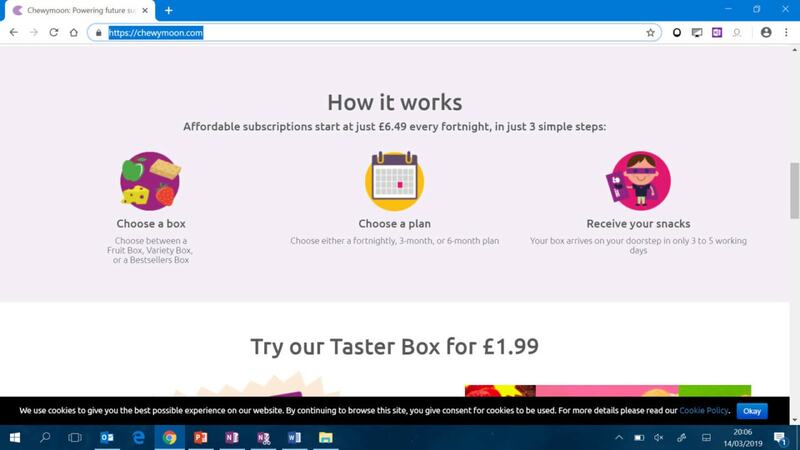 Based on a subscription plan, you can go via the website at chewymoon.com and follow their three simple steps to customise a snack boxes for your child. We were sent some boxes of snacks to test out and were really impressed with what we found. First of all, the box is carefully designed, so easily fits through the letterbox (a nice surprise to be waiting on the doormat when you come home!). Secondary, the box contains a selection of smaller, palm sized boxes all filled with small snacks which follow the exact likes of your child. The little boxes are small and brightly designed, the only problem we found was that neither child could open the wrapper round the box without help (the oldest is 9 years old and so would want to be able to do this independently). The size of the boxes was ideal. They provide a portion big enough for your child to feel they are getting a snack, yet not to big that it fills them up too much! I also liked the fact that they were easy to slip into a book bag (for break time), a lunch box (as a treat) or a grownups pocket (for that emergency snack you never leave home without!). The selection of snacks covers sweet and savoury options and we had a sample across the range. The box comes with a clear ingredients list which shows you the ingredients for each product as well as the nutritional information, a handy size to pop on the fridge door as a quick reference guide. The website also lists each product in detail with advice as to whether the item is a ‘treat’ or ‘hunger buster’ as well as key nutritional information. The older one went straight for the savoury snacks (‘Popped Cheddar’ was a real hit! ), while my littlest one has a very sweet tooth and we found he was satisfied that the fruit based snacks were a treat. He was particularly fond of the ‘noodles’ which we tried in kiwi flavour as well as anything that was in a ‘finger’ shape (mango was delicious!). The smaller ‘star’ shaped snacks were not his first choice although I would imagine they would be ideal for little ones while needing to entertain them in a highchair! There was also a Coco Banana Flapjack (which I got excited about as it didn’t contain wheat!) which both children absolutely loved! The tiny corner I tasted was delicious! The snacks also come with a small pack of stickers and a ‘Top Trumps’ style card, featuring one of the characters from the packaging. I am currently training for the London Marathon and am always on the lookout for alternatives to the gels and other energy products marketed at runners, I found the ‘finger’ snacks, particularly the peach and mango flavours, an excellent size to pop in my running belt and easy to eat whilst out for a run! So if you have perpetual ‘snackers’, like me, this might be a product that’s worth a try!